Sharing, making friends, paying attention, expressing emotions, and dealing with challenges successfully are critical to lifelong learning, success, and happiness. These skills are part of social and emotional development, which begins with children’s earliest relationships and experiences and has big impacts on later outcomes - not just for children, but for their families and communities, too! Social and emotional development involves several interrelated areas of development, including social interaction, emotional awareness, and self-regulation. Below are examples of important aspects of social and emotional development for young children. Social interaction focuses on the relationships we share with others, including relationships with adults and peers. As children develop socially, they learn to take turns, help their friends, play together, and cooperate with others. Emotional awareness includes the ability to recognize and understand our own feelings and actions and those of other people, and how our own feelings and actions affect ourselves and others. Self-regulation is the ability to express thoughts, feelings and behaviors in socially appropriate ways. Learning to calm down when angry or excited and persisting at difficult tasks are examples of self-regulation. Social and emotional development begins in the earliest moments. Infants learn through social interactions with the adults who care for them and most are born with the ability to read basic social cues. For example, in the first hours of life, infants turn their heads toward their parents’ voices. Later in infancy, most babies learn to look to where adults are looking or pointing and then begin imitating simple actions and sounds during interactions with caregivers. For some children with developmental delays or disabilities, milestones may come a little later or children may need extra support to enhance their social and emotional development. Supporting all young children’s early social interactions help them begin to understand their world and open the door for the earliest learning experiences. Children with a strong social and emotional foundation are more likely to graduate high school, go to college, and fare better on measures of overall wellness. 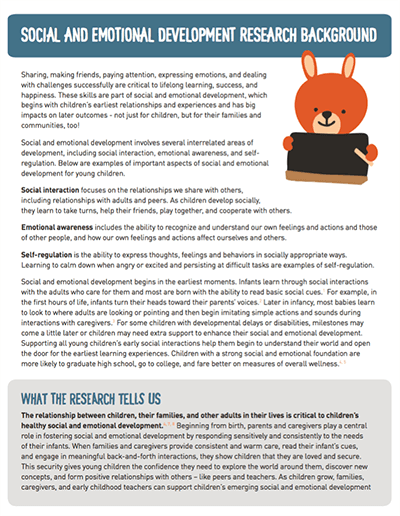 Learn more about what the research on early social and emotional development tells us by downloading the handout today.